Introduction: Nanobacteria are mysterious particles that have spurred one of the biggest controversies in modern microbiology. The apatite mineral around the nanobacteria serves as a primary defense shield against various chemicals and extremely harsh condition. It is combined with a very slow metabolism of nanobacteria. These two items would be the likely explanation for the sever resistance of nanobacteria. 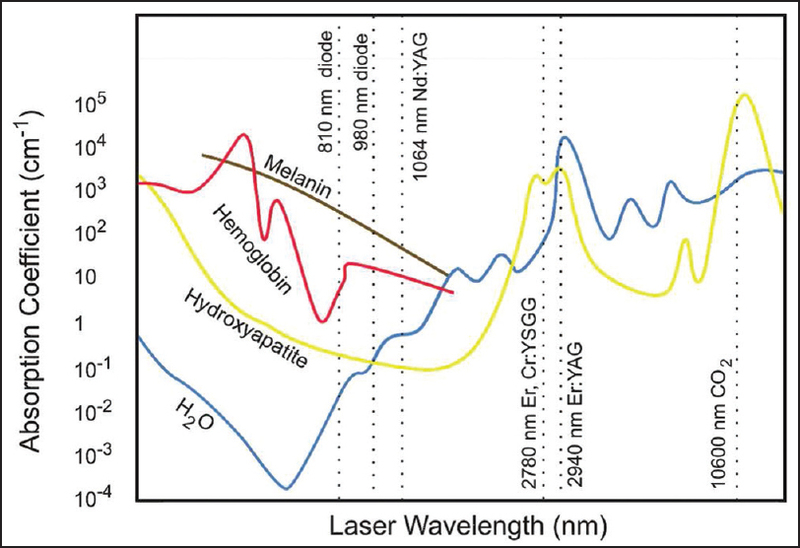 The Hypothesis: The CO 2 laser is a continuous wave gas laser and emits infrared light at 9,600-10,600 nm in an easily manipulated focused beam that is well absorbed by water and hydroxyapatite. Hence, it seems logical to postulate that CO 2 laser can be used successfully to destroy defensive external hydroxyapatite layer of nanobacteria. Evaluation of the Hypothesis: Main criticism with this hypothesis is differential radiation of nanobacteria. It is well known that CO 2 laser has high water absorption and consequently can cause unwanted damage to human host tissues. Moreover, unbelievably nanobacteria can bring us new disease via clouds  and cosmically  through space travels or meteorites or interstellar dusts. As mentioned previously, the apatite mineral around nanobacteria serves as a primary defense shield. ,,, On the other hand, as shown in [Figure 1], hydroxyapatite has high absorption coefficient for CO 2 laser. Hence, it seems logical to postulate that CO 2 laser can be used successfully to destroy defensive external hydroxyapatite layer of nanobacteria. Already several anti-nanobacterial treatment are available, e.g. usage of tetracycline and ethylenediaminetetraacetic acid (EDTA). ,, Yet, usage of laser is a new concept. The main criticism with this hypothesis is differential radiation of nanobacteria. It is well known that CO 2 laser has high water absorption  and consequently can cause damage to human host tissues. Hence, destroying of defensive external hydroxyapatite layer of nanobacteria will cause some harms to surrounding human tissues. Also, when trying to put into practice anti-nanobacterial CO 2 laser consideration of laser safety will be very important. Furthermore, more clinical investigations are necessary to determine and specify CO 2 laser parameters, e.g. pulse width or exposure duration, focal spot, treatment energy, and power irradiance or fluency. The authors do not have any financial support. Jafar Kolahi has editorial involvement with Dent Hypotheses. Kolahi J, Shahmoradi M, Sadreshkevary M. Nanobacteria and dental practice. 1 st ed. Lulu Press, Inc; 2012. Available from: http://www.researchgate.net/publication/233791903_Nanobacteria_and_Dental_Practice?ev=prf_pub [Last accessed on 2014 Mar 21]. Kajander EO. Nanobacteria - propagating calcifying nanoparticles. Lett Appl Microbiol 2006;42:549-52. Barr SC, Linke RA, Janssen D, Guard CL, Smith MC, Daugherty CS, et al. Detection of biofilm formation and nanobacteria under long-term cell culture conditions in serum samples of cattle, goats, cats, and dogs. Am J Vet Res 2003;64:176-82. Breitschwerdt EB, Sontakke S, Cannedy A, Hancock SI, Bradley JM. Infection with Bartonella weissii and detection of Nanobacterium antigens in a North Carolina beef herd. J Clin Microbiol 2001;39:879-82. Wang XJ, Liu W, Yang ZL, Wei H, Wen Y, Li YG. The detection of nanobacteria infection in serum of healthy Chinese people. Zhonghua Liu Xing Bing Xue Za Zhi 2004;25:492-4. Li Y, Wen Y, Yang Z, Wei H, Liu W, Tan A, et al. Culture and identification of nanobacteria in bile. Zhonghua Yi Xue Za Zhi 2002;82:1557-60. Ciftcioglu N, Kajander EO. Interaction of nanobacteria with cultured mammalian cells. Pathophysiology 1998;4:259-70. Kim BH, Park HS, Kim HJ, Kim GT, Chang IS, Lee J, et al. Enrichment of microbial community generating electricity using a fuel-cell-type electrochemical cell. Appl Microbiol Biotechnol 2004;63:672-81. Wainwright M, Weber PK, Smith JB, Hutcheon ID, Klyce B, Wickramasinghe NC, et al. Studies on bacteria-like particles sampled from the stratosphere. Aerobiologia 2004;20:237-40. Wickramasinghe J, Wickramasinghe NC. A cosmic prevalence of nanobacteria? Astrophys Space Sci 2006;305:411-3. Benzerara K, Menguy N, Guyot F, Dominici C, Gillet P. Nanobacteria-like calcite single crystals at the surface of the Tataouine meteorite. Proc Natl Acad Sci U S A 2003;100:7438-42. News, BBC. Do nanobacteria rule Earth and Mars? 1999. Available from: http://news.bbc.co.uk/2/hi/science/nature/300949.stm [Last accessed on 2014 Mar 21]. Kolahi J, Shahmoradi M, Sadreshkevary M. Nanobacteria in clouds can spread oral pathologic calcifications around the world. Dent Hypotheses 2012;3:138-41. Kolahi J. Cosmic transmission of periodontal, cardiovascular and kidney disease via nanobacteria. Dent Hypotheses 2011;2:49-54. Kolahi J, Shayesteh YS, Shirani G. Transmission of hazardous diseases via nanobacterial contamination of medical and dental equipment. Dent Hypotheses 2013;4:80-2. Björklund M, Ciftcioglu N, Kajander EO. Extraordinary survival of nanobacteria under extreme conditions. Part of the SPIE Conference on Instruments. Methods and Missions for Astrobiologv, Vol 3441. San Diego, California: SPIE; 1998. Available from: http://www.nanobiotech.us/storage/8%20Bjorklund.%201998.%20Proc%20SPIE%203441_123-129.pdf [Last accessed on 2014 Mar 21]. Ciftcioglu N, Kajander EO. Methods for eradication of nanobacteria (US 6706290 B1). Available from: http://www.google.com/patents/US6706290?dq=nanobacteria&hl=en&sa=X&ei=TC7EUZGvD4Ho0gGYzIHQAw&ved=0CFcQ6AEwBQ [Last accessed on 2014 Mar 21]. Burke PA, Fix KA, Mcdonnell GE. Deactivation of mineral encapsulated nanobacteria (WO 2007145608 A2). Available from: http://www.google.com/patents/WO2007145608A2?cl=en [Last accessed on 2014 Mar 21]. Parker S. Verifiable CPD paper: Laser-tissue interaction. Br Dent J 2007;202:73-81. Parker S. Verifiable CPD paper: Introduction, history of lasers and laser light production. Br Dent J 2007;202:21-31. Kolahi J. Anti-nanobacterial therapy for prevention and control of periodontal diseases. Dent Hypotheses 2010;1:4-8. Parker S. Laser regulation and safety in general dental practice. Br Dent J 2007;202:523-32.